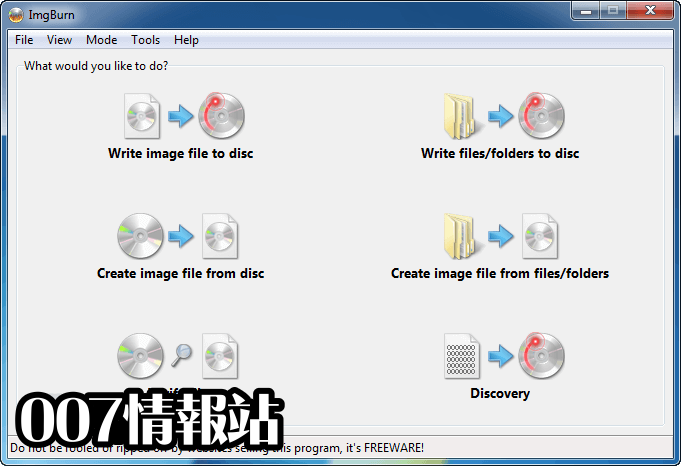 ImgBurn 是一款輕量級 CD，DVD，HD-DVD 或藍光刻錄應用程序。它有幾種模式，每種模式用於執行不同的任務，例如將光盤讀取到映像文件，通過計算機或網絡上的文件創建映像文件（也可以將文件直接寫入光盤），將映像文件寫入一張光盤，確保一張光盤是 100％可讀的（你也可以用 ImgBurn 對比一個給定的圖像文件來確保實際的數據是正確的），並發現與 DVDInfoPro 結合使用，你可以檢查燒錄質量支持 BIN，CCD，CDI，CUE，DI，DVD，GI，IMG，ISO，MDS，NRG 和 PDI 等多種圖像文件格式。它可以通過 DirectShow / ACM 支持的任何文件類型（包括 AAC，APE，FLAC，M4A，MP3，MP4，MPC，OGG，PCM，WAV，WMA 和 WV）刻錄音頻 CD。您可以使用它輕鬆地（從 VIDEO_TS 文件夾），HD DVD 視頻光盤（從 HVDVD_TS 文件夾）和藍光視頻光盤（從 BDAV / BDMV 文件夾）建立 DVD 視頻光盤. 讀取 - 將光盤讀取到映像文件中構建 - 從計算機或網絡上的文件創建映像文件 - 或者可以將文件直接寫入光盤寫入 - 將映像文件寫入光盤驗證 - 檢查光盤是否 100％可讀。或者，你也可以用 ImgBurn 比較給定的圖像文件，以確保實際的數據是正確的發現 - 把你的驅動器 / 媒體測試！與 DVDInfoPro 結合使用，可以檢查驅動器正在產生的灼傷質量注意：此應用程序已經停產. - Added: Log entry when burning that shows the number of discs a Lite-On drive thinks it has burnt. - Added: Pioneer drives now list their 'Kernel Version' next to the firmware version. - Added: The Windows 7+ taskbar button/progress display now turns red if an I/O error box pops up during a read/write (etc.) operation. - Added: The ability to set the 'Platform ID' when building a bootable disc - thus enabling the creation of UEFI bootable discs. - Added: Internal version of the 'BurnerMax Payload' code (well, what I could figure out) to allow for overburning DVD+R DL on many MediaTek chipset based drives. In practice, this only seems to work on Lite-On (and clone) drives that have 'Force HyperTuning' enabled. - Added: MSF info to the 'Sector Viewer' tool. 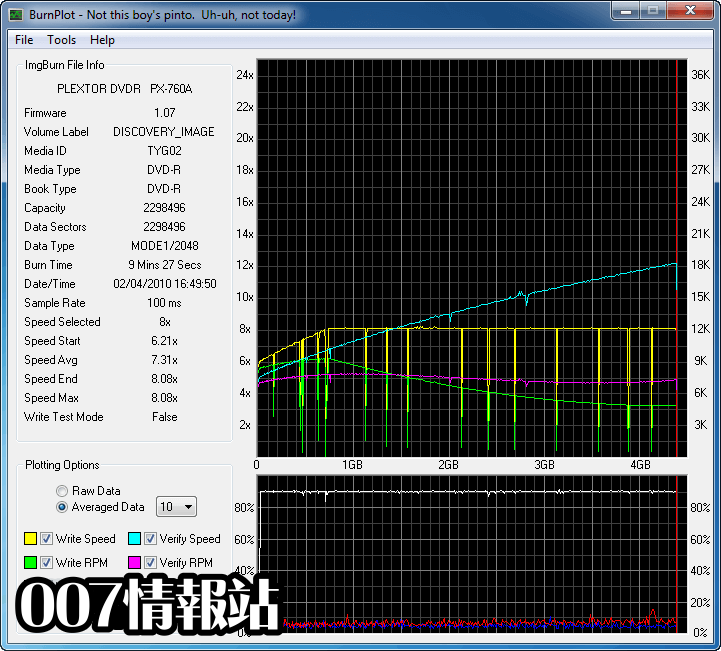 - Added: Allow for larger I/O buffer (1GB). 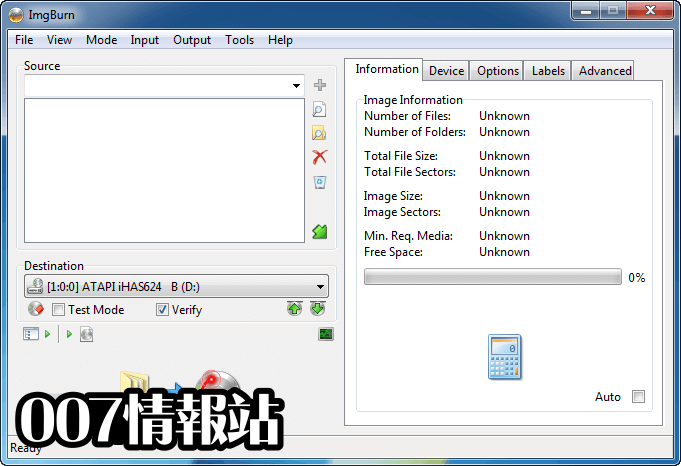 - Added: Option to pick the transfer size (32KB -> 512 KB) used when reading / writing files. - Added: Option to enable/disable the OS's buffering when writing image files. - Added: Ability to make the Explorer pane in the DLE window 'Read Only'. - Added: Support for Opus audio compression format. - Added: Support for TAK lossless audio compression format (including embedded CUE sheets). - Added: Ability to use a '*' wildcard for 'backup list' directory entries in an IBB project file (applies to Advanced input mode). - Changed: No longer bundling/offering the Ask.com toolbar in the setup program, OpenCandy now handles product offerings during installation. - Changed: Buffered I/O is now enabled by default for reading/writing files. - Changed: Update the splashscreen logo. - Changed: The 'Delete' option/button in the Disc Layout Editor has been renamed to 'Remove' so it matches the one in Standard input mode (and so people aren't put off by the term 'Delete' - thinking it'll actually delete the file on their hard drive). - Changed/Fixed: Detect oversized UDF File Entry descriptors and don't attempt to parse them. - Changed/Fixed: Restore 'Disc Layout Editor' window's focus when the application becomes active. - Changed/Fixed: Workaround for the new 16x LG Blu-ray writers that report the wrong (a truncated) current write speed value in the 'GET PERFORMANCE' response when burning at 16x. - Changed/Fixed: Workaround for newer LG drives with the 'Silent Play' feature that seem to ignore attempts to set the read speed via the 'SET STREAMING' command. They get fixed on 1x and won't read any faster! - Changed/Fixed: Attempt to block users from trying to write discs their 'combo' drive doesn't support (i.e. a DVD+RW/BD-ROM combo drive trying to burn BD-R). - Changed/Fixed: Potential errors were being ignored/lost when setting a 'changeable' layer break position to its current/maximum value. The program now reports them. - Changed/Fixed: Tweaked the 'browse for folder/file' dialog code to hopefully stop the OS from throwing up a 'There is no disk in the drive. Please insert a disk into drive X:.' error when the MRU location is a drive that no longer has a disc in it. - Changed/Fixed: Reworked some commands that could optionally not use 'Immediate I/O'. Old code could fall back to 'Non-Immediate I/O' and loose the initial error message from the 'Immediate I/O' version of the command. - Changed/Fixed: Made an adjustment (potential bug fix) to my drag+drop component's code. It may cut down on crashes / weird things happening as a result of the user having performed a d+d operation. - Changed/Fixed: 'Shutdown Computer' checkboxes should have read 'Shut Down Computer'. - Changed/Fixed: Recently added 'MID' info to was missing from the disc info text in Read / Verify modes. - Fixed: Cosmetic issue displaying numbers when the user's 'thousands separator' is set to nothing. 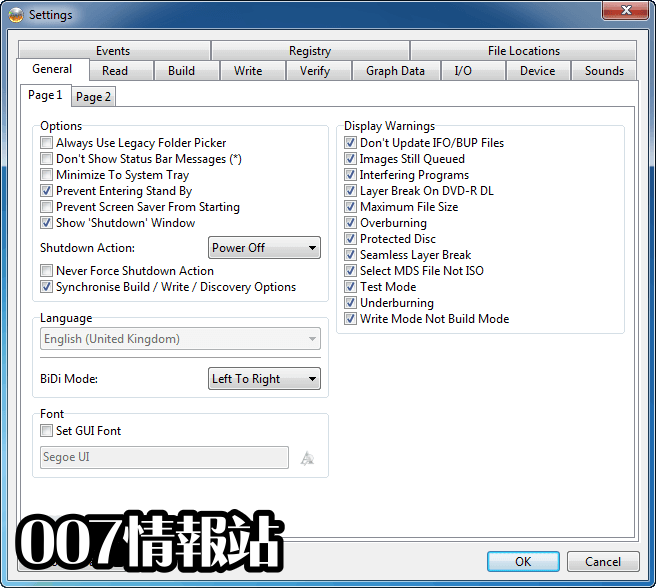 - Fixed: Displaying wrong firmware subversion on newer LG Blu-ray drives (BH14+). - Fixed: Memory leak when burning Audio CDs that use DirectShow for decoding. - Fixed: Memory leak when burning an Audio CDs where the files are already in the correct format for burning (no decode required). - Fixed: Potential access violation when reading a field in a UDF 'File Set Descriptor'. - Fixed: Old (orphaned) AWS related registry/ini file entries were being left behind - this was perfectly fine, it's just nice to keep the place tidy! - Fixed: DLE Window's Disc Toolbar wasn't being resized for higher DPI systems - meaning the buttons weren't fully visible. 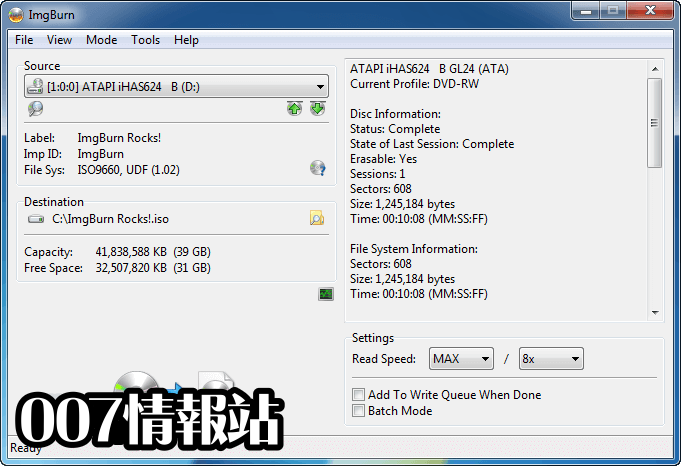 - Fixed: When outputting Mode2/Form1/2352 from Build mode, the program didn't take into account any additional data type conversion required for the drive - this could produce a corrupt disc.